We planned a vacation with BookVIP.com and they cancelled our vacation that was confirmed by the Villa Del Parmar resort in Cancun, Mexico. We paid for a package and were also charged more for the package than agreed upon. We then were told our reservation was cancelled by error and that they could not give us our original reservation. They then offered a terrible resort and to pay a minimal adjustment that wasn't what the resort was even being shown to be selling at. They harassed us repeatedly, would not let us speak with supervisors or their legal department as we requested. We are now out a vacation and the $1,200.00 for airfare to Cancun because we have no intention, after this nightmare, to spend what we wanted to go there for which is a relaxing holiday. They intentionally also called us several times a day and kept saying we cancelled our reservation. This actually caused us duress and it's criminal what they do. They are committing fraud by scamming people into a better resort and cancelling their reservations and trying to put people in a much less of a quality resort. The difference was night and day and we had not intention of traveling all the way there since they were so shady and dishonest. Don't use these folks. We will be filing a legal claim and also requesting compensation for the damages caused due to the duress. Review #481314 is a subjective opinion of gammicca. booked and charged for one package, told it wasn't available unless I paid $640 more, told them I need to cancel reservation. They said management will call you back. I 've called four times, never recieved a call back yet, never recieved any sort of cancellation notification or confirmation from any one. It took one day to charge my card, now it's been 4 days and I can't even speak to any one about the cancellation and every time I call they say oh yes, I see your reservation here. Bait and switch or just thievery? As I explained in my email and voice mail. We sincerely apologize on any confusion, however, I assure it was definitely not intentional. The resort classifies your oldest child who is 18 as an adult and not a child. The 1 bedroom room occupancy allows for 2 adults and 3 children under the special promotion and we had to get an exception on this hotel rule which were able to get approved yesterday. As an owner I definitely stand behind our product and services as we are the largest travel promotions company and have an A rating with Better Business Bureau. We definitely go extra lengths to get special approvals and I apologize if it was not expedited and communicated properly. That being said, I have made sure your refund is processed tonight. Same happened to me - just now. Booked, accepted, then tried bait switch to... Holiday Inn. Did you ever get anywhere with the legal end? I am looking at filing legally as well and try to get back some of which they have "screwed" me out of. This is no surprize your *** commercial went on and on. I tried to contact you. We never tried to change the reservation and were called several times by parties asking for more money. Our reservation date was confirmed and then your agency cancelled it after we booked our airfare. We lost $500.00 in airfare when we had to change our tickets to use them to travel elsewhere. We never tried to travel in a group, which both your staff and the resort told us, but we were only traveling alone....two of us, for a much needed vacation. This is a scam and it cost us much. We are looking to file complaints and sue for our lost travel and the emotional distress that your staff caused repeatedly harassing us over the phone and lying that we cancelled our reservation. We didn't and your staff it seems never did what they were required to do. Additionally we asked for a stay at a comparable resort which was possible and they tried to put us in hotels that were a fraction of the cost and rated with two stars on many sites. Your agency was a nightmare to work with and we've posted this because we travel often, know the ins and outs of such promotional deals and were interested in the property. Your unprofessionalism needs to be known to others. 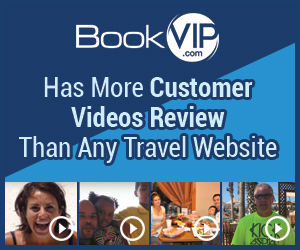 I am one of the owners of Bookvip.com and you can contact me directly james@rvitravel.net. We are the largest travel promotions company and handle over a ten of thousands special promotion packages per year without any issue. Like any company, we are not perfect and we are always looking to improve. The most difficult part in selling the discounted promotional packages are the terms and conditions that the resort sets as they are ones subsidizing the cost of the rooms for qualified customers to listen to their vacation ownership /timeshare presentation. Again, the rooms are discounted many times over $1000 in exchange of the customer's time and meeting the resort's qualifications. Where most issues occur is where the customer tries to circumvent the resort's qualifications and the resort denies the reservation or where rooms become unavailable due to sold out dates in which we always refund the customer. One of the most difficult items we deal with is group travel as the resorts don't permit it with the promotion. All of these terms & conditions are disclosed on the site as well. Each customer signs electronically the terms & conditions before we ever charge a customer. That's the same answer you used on another web site. You didn't address the problem!!!!!!! I booked this vacation in June of 2014 and now in December, after trying to change the date, am I having the exact same issues. I have been accused and told that I would be charge $750 per night to stay at the hotel if I showed up on these dates because someone else changed the dates to the same time that I am and they happen to live in the same state. Now I am being told that I can't get my money back from BookVIP but the hotel will only give me my upgrade amount back, and that is after BookVIP cancels my reservations. BookVIP won't cancel my reservation or give me anything other than an opened ended (18 month) vacation, but after reading the comments above is a total rip off. So lesson learned that this company is truly trying to get every penny they can. So disappointed that I will let everyone I know through all media efforts that I have, NOT to every book with BookVIP!!!! We had a very similiar experience with Apple Vacations a few years ago. Actually even worse.